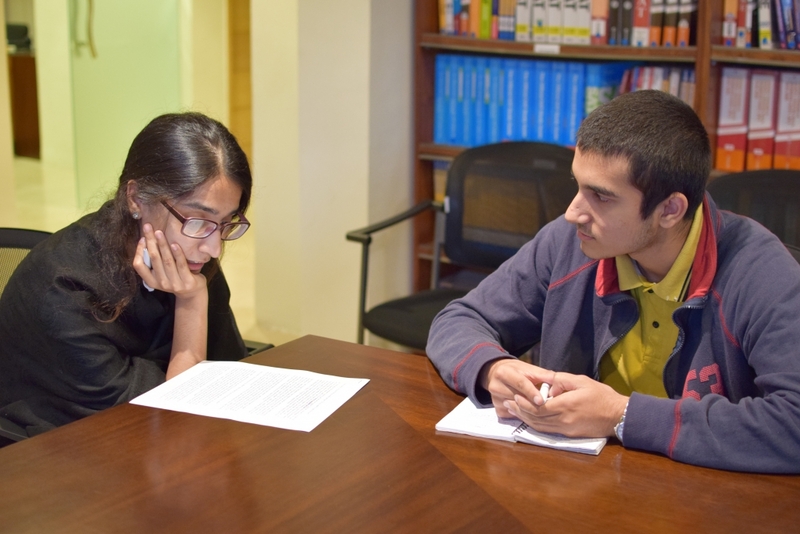 (Pictured) Sameea Najam with an advisee. I read those final words of the would-be bildungsroman out loud and fell silent, re-reading parts of it before I gave him my thoughts. And I had quite a few: how mechanical the piece seemed, the fact that the moral didn’t include making amends with those he’d hurt, and that his overall tone seemed angry and self-critical. But more than anything, I wondered about that last line: happiness is […] attained through disregarding them entirely? That didn’t seem to be true, even in the story he was telling. So I asked him about it. ‘I’m wondering about this last line, here.’ I pointed to the incriminating sentence. He nodded. Advising sessions like this one often require a little more counseling, trying to figure out what the student is trying to say, whether he or she is communicating it well, and in this case — and my own personal favorite — jumping off of one stray sentence to see if they should be writing about something else entirely. So we talked. About how he grew popular, about all the things he did for acceptance, and the consequences they had on him; how he never really felt in his element even when he had a lot of friends, and how his life now felt far more meaningful with just a few. Advising sessions like this one often require a little more counseling, trying to figure out what the student is trying to say, whether he or she is communicating it well, and in this case — and my own personal favorite — jumping off of one stray sentence to see if they should be writing about something else entirely. Talha was eventually able to elaborate on his thoughts: his happiness came from his hard-won ability to be content with himself that he was able to achieve, he concluded, through distance from his friends and the passage of time. He did. And what started off as a story about popularity and acceptance ended in a conversation about his intrapersonal skills and how his contemplative nature helped him find happiness and made him feel like a good fit for the humanities. He took home my reading recommendation (a chapter of ‘7 Kinds of Smart‘) and would return with a rewrite. Essay feedback can be one of the most challenging parts of the application process. As Advisers, we must always ensure that we guide students in a way that honors their voice and respects their thoughts, while challenging them to think deeper, ask better questions, and draw better connections… all without losing their voice. It’s a difficult job, but as I read the opening to Talha’s redrafted essay, it reminds me it’s a rewarding one too. Sameea Najam is an EducationUSA Adviser at USEFP Islamabad. Please click here to consult an adviser for applying to the U.S. for higher education.